Over 11,000 people from 116 countries will be coming to Ireland for the five day event of WMOF 2018 beginning this Wednesday. In many cases whole families will be coming. From our diocese 236 people have signed up as volunteers and 130 are rehearsing to be part of the choir at the final Mass. I urge all of us to join in participation in the WMOF 2018 and in the visit of Pope Francis. Please do so whether you travel to Dublin or Knock or remain at home. Thanks to RTE, (both T.V. and Radio) and to all the social media outlets you can join in from your own home. Look up the programme schedule well in advance. Watch it with other family members. The WMOF asks us to reflect on ‘family’. The visit of the Pope asks us to reflect also on our faith in God, – God who through Jesus Christ has revealed himself to us as at the heart of everything in our world. Think of ‘family’ worldwide: rich and poor; in all nations, cultures and faiths; all ages from new born children to those past their hundredth birthdays. As you think of family think of your own family back through recent generations. Remember the joys and sorrows, the births and deaths, the family celebrations, and the healings and recoveries after sad losses. I find myself reflecting on my own family at this time. This month one hundred years ago my father was born. Give thanks for all the life and love in your family through recent generations. Recommit to always giving personal priority to family. 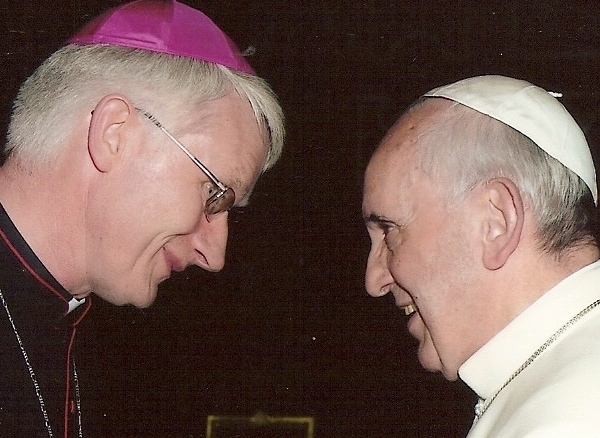 With Pope Francis let this be a special week in all our homes. Ponder, pray for, and work for ‘family life’, and for living ‘the Christian life of faith, hope and love’. All are welcome to join us in Killarney Cathedral this Tuesday evening at 6.15pm to celebrate a special Mass to mark the opening of WMOF 2018.